Lands matters build of Muldrotha, the Gravetide . Deck is very grindy but has a couple ways to explode in a turn, backed up by efficient removal and interaction. Lands Lands Lands & Other Ramp: First let’s see how many extra land drops we’ll get with Exploration , Azusa, Lost but Seeking , Wayward Swordtooth , Oracle of Mul Daya and The Gitrog Monster . That’s 6 extra a turn! So 6 extra Tatyova, Benthic Druid triggers, 6 extra Strip Mine pops or 6 extra drains with Ob Nixilis, the Fallen & Retreat to Hagra . Hell yea. 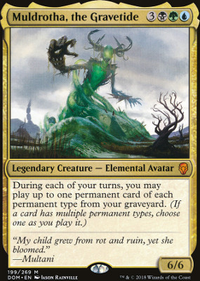 Other Ramp finds the usual dorks and value creatures, but I want to shout out Krosan Wayfarer . This little dude seems at first a value ramp, letting you sac him to get another land out early on. Sure. However, do not be mistaken. 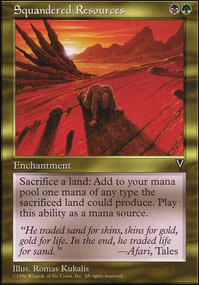 We can sandbag any of these lands for instant speed shenanigans, waiting for the perfect moment to sneak ‘em in - Bojuka Bog , Glacial Chasm , Maze of Ith , Strip Mine . All of a sudden, our unassuming druid is something our opponent’s will be forced to think about and play around in the future, or when we recast with Muldrotha. Other fun plays with Krosan Wayfarer are end of turn, sac, put out Boseiju, Who Shelters All , untap for an uncounterable Torment of Hailfire . How about that hexproof commander?? Seal of Removal looking pretty amazing when we sneak in an Arcane Lighthouse . Or maybe we’re one land short for that crucial Cyclonic Rift ...lol no we aren’t. Sac, land, rift. Personal favorite is end of turn Dark Depths combo, if we have the other piece in hand. Card Draw and Advantage: While Tatyova, Benthic Druid or Nissa, Vital Force are land drop payoffs, this deck also is sac’ing lands a ton which The Gitrog Monster loves (side note: this incidental value is why I’m running Mazirek, Kraul Death Priest , been liking the performance so far). We also run Trade Routes , Thrasios, Triton Hero and Tasigur, the Golden Fang as mana sinks to keep the Gravetide flowing. Other goodstuff card advantage can be seen in the list, feat with spicy Sygg, River Cutthroat . Flavorful with the bayou feel of the deck and quite good in general. All else is a mashup of Gravetide Goodstuff with a dash of spice! Suggestions welcome!